It’s five month since I last posted, and yet I have so much to write about! My working patterns changed in October 2016; I’m now part time with my employer having started a PhD project with the universities of Reading and Southampton. More about that later, but suffice to day I’ve been in the library much more than the workshop. Plans. A post about carving oak with flint blades prompted by a meeting with archaeologists to discuss a remarkable late-Mesolith/early-Neolithic Welsh artefact. A post about flint. A post about sarsen. More posts about sarsen. A post about straw plait. A post about frustration with a fabulous but tantalisingly distant museum collection. Hopes for more woody Must Farm replication. And more. I hope you will bear with me as I creakingly get myself into gear, to spend more time here sharing photos, experiences, and thoughts. I can’t quite believe I’m going to try this. But apparently you can knap a King Edward. The awesome Beccy Scott at the British Museum, who is part of the Ice Age Island team, is known for replacing a flint nodule with a potato to demonstrate how knapping works. The potato is safer than sharp, shattery, flint bits flying all over the place. That means it’s good for a demonstration, and for people to try out, when you haven’t got safety goggles to go around. That’s a big, chunky, potato flake! Not quite what I expected, but I might not be doing it right. This is what happened when I tried to reduce (=knap bits off) that first removal (=flake). I even managed to take a bit off with an antler hammer. But it was mostly crushy and squashy rather than flakey. I’d love to see Beccy’s Levallois demonstration. Demonstrating ancient technology and ways of life, getting across archaeologists’ interpretations of prehistory, communicating modern understandings of the past, are all really important. Whether it’s explaining why the digging methods and behaviours broadcast in Channel 5’s execrable “World War II: Battlefield Recovery” are terrible; or helping Primary School teachers (who themselves dropped history aged 13) to teach the Stone Age to their 7 year-old pupils; or persuading politicians that cutting the already-minuscule budgets for museums and archives is a false economy. Misunderstandings about the past, and about what archaeologists and curators do, are legion. Take flint knapping. It’s not something for grunting cave-men dressed in animal skins, so stupid they can only bash rocks together. It’s a skilled activity, the principal way that modern humans and their ancestors made stone tools for hundreds of thousands of years. Without flint knapping, would we be around today? But how can a UK Primary School teacher, who has never been taught archaeology, who doesn’t have the skills, and who might struggle to get hold of the raw materials, best convey this awesomeness to their pupils? That’s why Schools Prehistory is introducing potato knapping to teachers. Take the appalling TV series currently on Channel 5, “World War II: Battlefield Recovery”. The programme makers seem to have ignored advice and decided it would be OK to show dangerous digging behaviour and inappropriate excavation of human remains (and all before the UK 9pm watershed). The dangerous behaviour includes using a mechanical digger to cut trenches in ground suspected to contain unexploded ordnance. Is this really what people think archaeology is like? I hope not, given they’ve been able to watch Time Team for years, and the fabulous Meet The Ancestors which, in its Revisited format, is currently on BBC4. But still, “World War II: Battlefield Recovery” got made. Take the dreadful threats to local museums and archaeology services – there’s news every month about different local authorities planning to slash, or even cut completely, budgets for museums and heritage services (like Lancashire and Norfolk and Shropshire right now). There is ample evidence for the economic value of our museums, and for ways in which they promote our health and well-being. It’s a false economy to slash archaeology services in planning departments: Britain needs a mix of regeneration and new development to deal with issues such as housing need. But the Council for British Archaeology is now describing parts of the country as “black holes” where local planning authorities have little or no access to historic environment specialists who could enable this economic growth. Spending on ‘combined heritage’ (including archives, heritage, museums and galleries, conservation and listed building planning policy, and archaeology) by local authorities amounts to less than half of one per cent of all local authority spending. We need to keep on, dispelling misconceptions about archaeology (cave-men, any fool can dig a trench…) and heritage (an expensive luxury that can be cut without consequence…). That’s my Grand Challenge for archaeology. In November 2014 I carried out a survey of Young Archaeologists’ Club Leaders, to find out about their understanding, and use, of experimental archaeology. I presented the survey results at the ninth Experimental Archaeology UK Conference, held in Dublin in January 2015. You can explore my Storify of live tweeting from the conference here. My survey was incentivised. Participating Leaders could put their names into a hat for a prize draw. The prize is a selection of artefacts, made by me, for use in YAC activities. They aren’t quite finished yet, a few minor adjustments remain to be made; but here’s a sneaky peek. The draw will happen this coming weekend (it’s taken me a bit longer than anticipated to finish making the things, but that’s another story). Blogging Archaeology – where are you/we going with blogging or would you it like to go? That’s where I would like not only mine but also other heritage-focused blogging to be going – to communicate with wide-ranging audiences. Not necessarily each blog, because some will remain specialist and targeted by necessity; but taken together, to be in touch with as many different people as possible. This conviction led me to take a broad look at the blogs that I am currently following; 21 blogs appearing in my WordPress Reader, one I pick up through RSS and two via e-mail. Why do I follow them and what can I learn from them? Where are they going? Here are a few observations based on the 21 blogs in my Reader. The blogs I follow – general classes of author type. Seven of the blogs are written by researchers at various stages of an academic career – everything from doctoral researcher to professor. Of the three museums, two are regional and one international in scope (some of the other museums that interest me do not blog (yet), but I stay in touch via other social media). “Heritage body” = a team within a national charity, a government agency and a conference whilst “Historic Environment commentator” comprises independent individuals or organisations. “Materials/craft” speaks for itself. In general I follow these blogs to be informed; to be educated; to keep up to date and in touch. I like learning from posts that extended my limited knowledge in various areas of archaeology/history theory and practice that aren’t my specialism; getting news about research progress, exhibitions, field projects, upcoming activities and events; finding out about inter-disciplinary research and interesting collaborative projects; exploring mixed-media posts that illustrate craft and manufacturing skills. 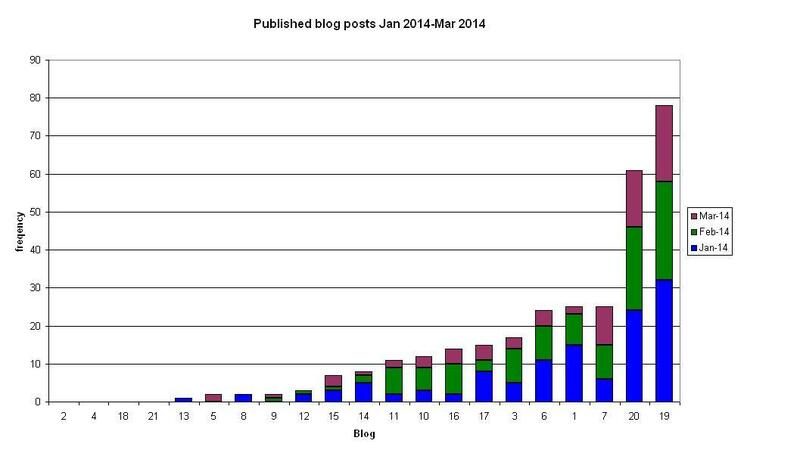 The frequency of blog posts published by the blogs I follow, for January, February and 1-23 March 2014. Having counted numbers of posts for this quarter and not a whole year, I can’t tell if my figures represent any seasonality in posting volume. Nevertheless, the two most prolific bloggers, numbers 20 and 19, are both from the “Historic Environment commentator” class. These two blogs’ remit is advocacy for the historic environment, and are run by independent groups who are concerned to raise awareness of threats to archaeology, both in the field and in museum collections around the world, and historic landscapes. No surprise that these are very active blogs. In contrast, four of the bloggers I follow haven’t posted yet in 2014; yet they have good past content. Blog 8 is the conference; this convenes in early January each year, so naturally it’s not posted in February or March. 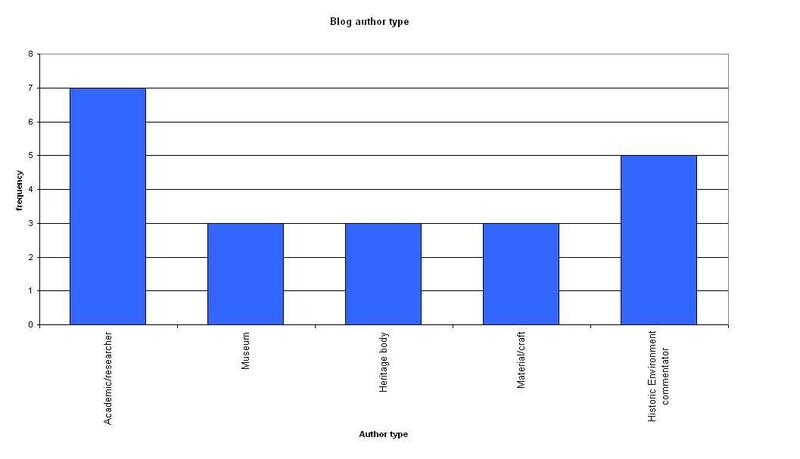 What’s more surprising is that the museums, blogs 2, 5 and 3, are not more prolific. Number 3 is the British Museum – with so many departments and projects I would have thought blogging might have a higher profile for outreach and communication purposes? Likewise blogs 9 and 11; these belong to national organisations. Are they worried about information-overload for their followers; or do they experience other constraints in their use of social media? I have chosen to follow these bloggers – and I want their content – so I have to assume that my followers also want my content. Lesson learned – keep posting! 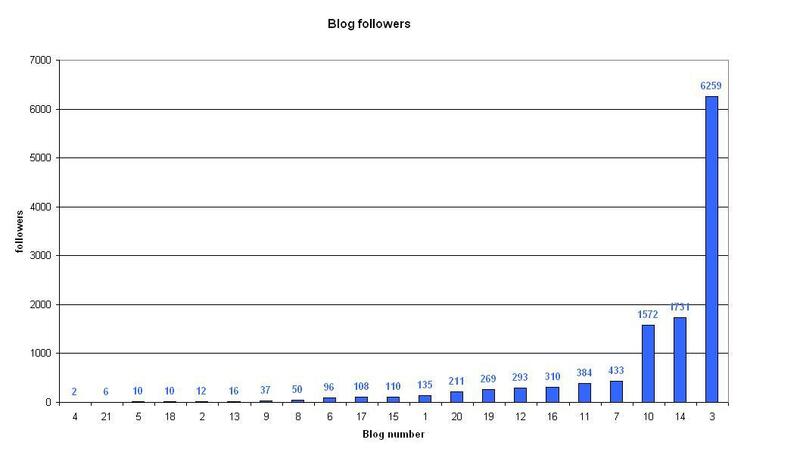 I also looked at the each blog’s number of followers. The figures come from the summary that the WordPress Reader gives when you select one of your followed blogs. These numbers are often different when you look at the counters that bloggers have on their pages, so I guess WordPress is only counting WordPress followers and not all followers using all platforms? The number of followers that WordPress indicates for the blogs that I follow. First, we must bear in mind that I have taken no account of how long these blogs have existed. It is reasonable to assume that longer-lived blogs are more likely to have more followers, whilst new bloggers have yet to attract their audience. Secondly, my figures are based on the WordPress count only. Nevertheless, the run-away winner is the British Museum with more than 6000 followers. The next nearest, yet not that near with under 2000, is a “Historic Environment commentator” – one whose face and name are familiar from the TV, who writes entertainingly about archaeology and other topics with equal fluency, and who is passionate about the subject. Blog 10 is written by an academic, high profile in their own circle, whose cross-disciplinary research must draw in readers from a range of subject areas. Everyone else comes in below 500 followers. Working backwards on the X axis from blog 7 to 17 we have: an academic; a heritage body; four historic environment commentators; three academics. The point that I am trying to make here is that my blogs with the most followers (blog 3 followed by blog 14) have equally high-profile authors – one of the most famous museums in the world, and (arguably) one of the most famous living archaeologists, at least in Britain. Discounting the conference for the moment because it is a special case, the two other organisations in my “Heritage Body” category – both national, well-established and high profile – should I think expect to have much bigger followings. Their blog content is (mostly) good. Perhaps the online audience demographic differs from their huge offline audience? Or perhaps they suffer from their organisations having multiple blogs, disproportionally promoted? Where do they think they are going with blogging? If I want to connect with a bigger audience – whether people who already go to pains to pursue their interests, or who are trying to find their way in – I need to think about how they will find me. Lesson learned – get internet-savvy and continue to make connections! Mike’s blog is full of great content, his ongoing coverage of the Richard III story being a case in point. “Heritage bloggers” have great content, and we could and should be the best advocates for the historic environment, for research, for museums, for skills; for all the things that we love and are enthusiastic about. Blogging Archaeology – what is your best (or worst) post, and why? January’s “blogging carnival” contribution (#BlogArch 3) – plenty of people rallied to Doug’s December call for posts, I expect this month to be no different! These are just some ideas to get people started but please use what ever criteria you want. At the moment my favourite post is my second (in practical terms, my first, because it’s the post I wrote after briefly laying out my introduction). My worst – well, various, because they are less satisfactory, more self-indulgent, or just not very good. My “best” post is probably the one I wrote earlier this month about EAC14 – this year’s UK Experimental Archaeology Conference, in Oxford. Blogging about it was an opportunity for me to clarify in my own mind what I got out of the conference and to get some of that down on ‘paper’, as it were. It made me express succinctly the key things that I took from papers presented over the two days at Merton College and the Research Laboratory for Archaeology and the History of Art. So it’s my “best” post because it helped me to summarize the most important things that I learnt, and reinforce them in my own mind. Otherwise, the paperwork would have been filed and my attendance wouldn’t have been as fruitful. Over 10 and 11 January I and around 70 other participants enjoyed EAC14, the eighth UK Experimental Archaeology Conference, in wet and woolly Oxford. Co-ordinated by Chelsea Budd and Christophe Snoeck, ably supported by a team of student volunteers and the EXARC team, the conference was really interesting and great fun. There was a generous mix of papers, workshops, museum visiting (we couldn’t miss some of Oxford’s amazing collections!) and down-time over lunch – and especially dinner, in the pub, catching up with friends and making new ones. I found five of the fifteen papers especially interesting and useful. Martin Smith from the University of Bournemouth described his research to test the efficacy of polyurethane bone substitutes in ballistics experiments. I liked this because it’s so important to question the strengths and weaknesses of the analogies that we use in archaeology (Wylie 1985). This is true of ethnographic analogies that might be called upon to discuss past cultural or social behaviours (like comparing Madagascan standing stones erected for the ancestors, to Stonehenge, for example)(Parker Pearson and Ramilisonina 1998); as well as the materials, tools and actions we use in archaeological experiments. So it was great to hear from a researcher who is investigating the quality of analogy. Related to Martin’s paper was the presentation by Meaghan Dyer on her Master’s work with Linda Fibiger at the University of Edinburgh. I met Meaghan briefly in December last year but hadn’t had the chance to find out more about her work as I shivered on the Marlborough Downs filming on a tv shoot. Meaghan has been using the self-same polyurethane bone substitutes to research aspects of inter-personal violence in the early Neolithic. Not that I have anything against flint – it’s very useful – but I always enjoy hearing and talking about non-flint stone technology. Elise Morero presented her team’s research into Bronze Age stone vase manufacture in the Eastern Mediterranean. It struck me that the lapidary techniques involved have much in common with methods and tools used to work precious stones (as opposed to striking those stone types that will flake, like flint), having seen the hollow forms and rock crystal on display at the Museum of London’s Cheapside Hoard exhibition. Elise concentrated on the hollowing technology; I would love to have heard about the techniques for shaping the outside of the vases, which may have involved turning. I do like a good lathe! Enora Gandon of the Institute of Archaeology Jerusalem gave us an excellent demonstration of one of the great strengths of experimental archaeology; that the results of projects using this methodology can play a role in the development of theoretical perspectives that are appropriate to the archaeological record (Bell 2009). Brendan O’Neill from University College Dublin gave us a master-class in project design – and another non-flint stone project, looking at felsite on Shetland. These two papers described projects that are great recommendations for the use of experiment in archaeology. And in relation to my interest in sarsen stone, I found Brendan’s paper very instructive and can’t wait to read the results. 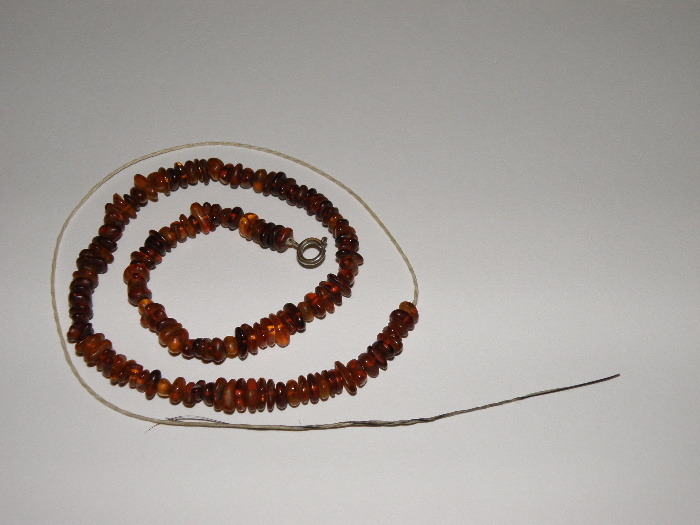 Re-stringing my amber bead necklace using linen yarn and a boar’s bristle needle. This has felt like an especially busy Advent. I’m always short of time during December, but since I’ve had these few days over Christmas to look back, I have realised just how frenetic it’s been this time round. There’s a just-started bowl in the clave in my workshop, untouched in at least a fortnight, and four badly-finished bobbins off the lathe. Not only are they badly finished; I couldn’t get them done in time for 14 December when we would have used them in a Young Archaeologists’ Club activity (fortunately there were a hundred and one other activities available for the YAC members to enjoy). It’s not simply that there is too much to do, what with seasonal rehearsals and performances, shopping, card-writing, activities to run and work to polish off before everyone goes on holiday. There just isn’t enough daylight. During Advent we got closer and closer to the Winter solstice (21 December this year). Currently on Greenwich Mean Time, clocks in Britain won’t go forward an hour for summertime Daylight Saving until 30 March 2014. And even though we’ve now passed the shortest day, the cloud-filled skies that we’ve been enjoying conspire to draw the nights in just as quickly. What with sunrise around 8am and sunset around 4pm, it’s been impossible to do any handiwork before or after work at the office. With no artificial light, I haven’t been able to do anything much – either coarse or fine work. Even bringing wood in from the woodshed for the stove is a darn nuisance in the dark. If I lived in a roundhouse I’d make sure I kept at least one night’s fuel inside to avoid blundering around in the damp, muddy wetness (which would also provide some warm fuel ready to burn better than putting cold logs onto the hearth). Ruth Goodman has made this observation a few times during episodes of “Tudor Monastery Farm” which has been showing on BBC tv. In their cod-sixteenth century world, they get up with the dawn and finish work with the sunset; apart from making some rush lights and enjoying the hearth fire, there’s no way to create a truly working light (tallow and expensive wax candles and glass balls filled with water aside; and how many of them do you need to carve, or sew, or weave?). How did the shepherds caring for the monastery’s huge flocks cope with lambing in the darkness? Or any of the other nightly emergencies on the farm? Even more amazing – how did the goldsmiths find enough light to complete the fabulously intricate work exemplified in the Cheapside Hoard, currently on display at the Museum of London in a marvellous special exhibition. The exhibition interpretation includes some information about the buildings of Goldsmiths’ Row on Cheapside, the likely layout of shopping and use of cocklofts in the four-story buildings for gilding rooms, taking advantage of south-facing windows for maximum natural light. Magnification must have been used for elements of the delicate soldiering, laying down enamel powders and other fine work (one of the figures in an engraving of a jeweller’s workshop, 1576, seems to be wearing spectacles – for short sight or magnification?). But lenses, whether ground glass or water bowls, aren’t enough on their own. You need excellent light, too. The dark is good for some jobs. Neil Burridge suggests that casting in the Bronze Age would have been carried out in the dark or semi-darkness, making it easier to use furnace and metal colours to judge the required temperatures. It’s amazing watching him work, sitting in a roundhouse at Trewortha with a sheet across the doorway to keep the real sun out whilst he pours liquid sun into a mould. And here I am, benefitting from electricity that (in the house, at least), extends my “working” hours as long as I want. It’s probably not good for us to be up at all hours. So I’ll call it a night. Well, the good mostly; because I haven’t been doing this long enough to have experienced the whole range of ups and downs. This post has less to do with my stated aims in writing a blog, and everything to do with the invitation given by Doug to join in a blogging carnival. This month, Doug is asking about archaeological bloggers’ experiences of blogging – the ups and downs. This made me reflect on my start in April this year, how I feel about my attempts at blogging, and what I’ve learnt so far. I’ve discovered that writing, albeit in a small way, about materials, objects, making things and artefacts is helping me to think about what I’m doing. Not only what I’m doing in the present, but what I might go on to do in the future. I didn’t anticipate this outcome when I first signed up on WordPress. At that time, I expected to write something like a cross between a diary and essays on the archaeological record and archaeological theory. Far more formal, and I’m so pleased it’s not like that. In fact, it helps me to write down a little about what I’m doing in learning about materials, replicating artefacts, experiencing materiality for myself. Discovering unexpected things about the natural resources that it’s otherwise so easy to take for granted (our museum stores are bursting at the seams with all that stuff, and that’s without all of the objects that once formed essential parts of people’s lives, made in biodegradable material, which we will so very rarely recover). Just as it’s easy to browse posts in the blogs that I follow, it’s easy to browse my own posts. Flicking through my posts is a convenient way to review progress, to remind myself what’s left undone, or where I might want to go next. I don’t have to have everything swimming round in my head, or photos inaccessibly buried in an external hard-drive. And it’s proving useful to be able to go back and have a look at what I’ve written. This is a learning process. At work, the audience for my written work is resolutely specialist, academic, technical, corporate. I can find a different voice in my blog. Part of the learning is learning about myself; being more realistic about my expectations of myself in blogging. Maybe my blog will become something more for me. I can imagine writing more extensive, referenced work; using my blog as an outlet for aspects of my research; and perhaps I will be able to develop an audience interested to follow artefactual. For now, I’m happy with how things are, and pleasantly surprised at how it’s turning out. (c) All images and text copyright Katy Whitaker 2013-16 unless otherwise stated.